World's Best Beer League Goalie...and he will tell you that too. Watch KVG's Movie Trailer - You May see The Cave! We're super pumped to announce one of our newest partners is the one-and-only BHLPA Executive & 5-time BHL cup winner Kane Van Gate (KVG). If you don't know who KVG is, what am I saying, of course you do, well then you know he has this HILARIOUS series on YouTube - Don't forget to subscribe! The Ultimate Hockey Fan Cave got to meet the man, the myth, the legend of the BHL series, KVG, at the hockey shop's Tendy Fest. With 3 of us at The Cave being goalies, we were really excited to participate in this great event. We got talking with KVG about all the cool hockey stick creations we have made and of course KVG wanted to try it on and use the giant Bauer Hockey goalie stick - finally something to stop the 5-hole goals. For once in his life, KVG was finally happy to be a full-right goalie cause all the vintage stuff was for rightys. We had a bunch of laughs and talked what only goalies talk about, goalie gear! Tendy Fest was only the beginning of working with KVG and Shutout Productions legend, Dave Delaney. Both of these gentleman were nice enough to make the trip across the pond from Vancouver to visit the Ultimate Hockey Fan Cave. 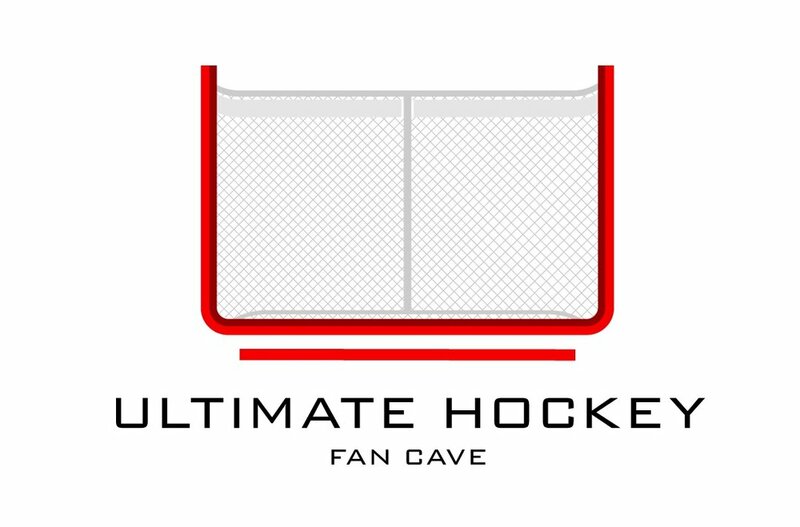 The Cave was even included in their latest video of their visit to Tendy Fest - be sure to pay attention at the beginning of the video for a Pavel Barber look-a-like. Subscribe and watch KVG's video from Tendy Fest. Well, we always tell people you have to see The Cave in person and KVG listened. We love to show off our work and we love it even more when people appreciate all the time and effort we've put in to building The Cave, its 100+ creations and its 1700+ hockey stick floor, and KVG was no exception to that. You can tell KVG loves hockey and loves goal tending, he was always drawn to the vintage goalie stuff but also took the time to hear all the stories behind the creations and memorabilia, which is something we take pride in. Very little of the stuff in The Cave is bought, so every piece has character, story and a reason why it's in The Cave. We can't wait to see the magic that Shutout Productions does with the footage they captured at The Cave - stay tuned to both of ours and KVG's social media accounts! KVG visited The Cave for about a 1.5 days, we got to know a bunch about him, the awesome YouTube series, his goaltending past and it was great to see that behind the big celebrity there is a genuine person who cares about his fans, he signed anything we wanted and took loads of pictures! KVG even signed and gave us his game used stick that has won 2 BHL championships. It is now hanging in the rafters of the Ultimate Hockey Fan Cave, no joke it's there! Be sure to check it our when you come by The Cave! We couldn't believe KVG wanted to come to The Cave and actually did, we had a blast, few beers and lots of laughs. I know The Cave can't wait till next Tendy Fest to hang with KVG and Shutout Productions again, if we don't get down to St. Louis before that! You'll be seeing some awesome collaborations from The Cave and KVG going forward!